From time to time there may be information on our Website that contains typographical errors, inaccuracies, or omissions. We reserve the right to correct any errors, inaccuracies, or omissions and to update information at any time without prior notice. This website (http://www.speedattackers.com/) and all content available on this website are provided on an “as is” basis without warranties of any kind, either express or implied, including without limitation warranties of title or implied warranties of merchantability or fitness for a particular purpose. You acknowledge, by your use of this website, that your use of this website is at your sole risk, that you assume full responsibility for all costs associated with all necessary servicing or repairs of any equipment you use in connection with your use of this website, and that Speed Attackers shall not be liable for any damages of any kind related to your use of this website. All of the Content you see on this website, including (but is not limited to) all of the page headers, images, illustrations, graphics, audio clips, video clips, and text, are subject to trademark, service mark, trade dress, copyright and/or other intellectual property rights or licenses held by Speed Attackers. The entire content of the this site is copyrighted as a collective work under copyright laws. You may download, print and store selected portions of the Content, provided you (1) only use these copies of the Content for your own personal, non-commercial use, (2) do not copy or post the Content on any network computer or broadcast the Content in any media, and (3) do not modify or alter the Content in any way, or delete or change any copyright or trademark notice. No right, title or interest in any downloaded materials is transferred to you as a result of any such downloading. 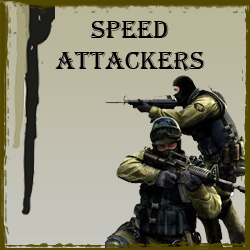 Speed Attackers reserves complete title and full intellectual property rights in any content you download from this website. This policy was last modified on February 13, 2011.